A native of Los Angeles, California, Jacinto Guevara (b. 1956) began drawing and painting “seriously” early in his life. Best known for his vibrant urban landscapes, Guevara began his “professional” artistic career in 1986 while living in the downtown Los Angeles’ Skid Row and Little Tokyo neighborhoods where he drew inspiration from its gritty streets and alleys. 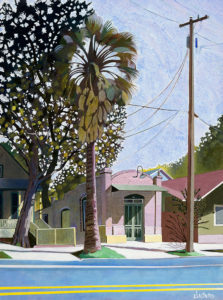 His affinity for unique bypassed neighborhood vistas continued and ultimately brought him to San Antonio in 1992 where has been living and working as a figurative plein air painter ever since. Guevara’s interests in native plants, wildlife, architecture, history and folklore are evident in much of his work. 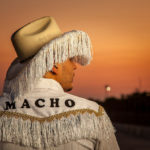 Additionally, Guevara’s work has extended to portraiture, sculpture, and performance as he is also an accomplished and versatile musician leading his own bands and performing acordeón in the música norteña/conjunto and Tex-Mex genres since 1977. 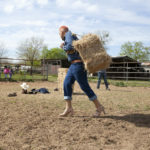 Guevara’s work has been exhibited and collected locally and internationally including work in the UTSA permanent collection and the private collections of Cheech Marín and Eric Clapton. In No Tiene Chiste, Guevara contemplates a year of dismal inspiration, a need for a new direction, the struggle with the materialistic corporate-consumer culture, the fear that his best work went unnoticed in the 70’s, and not surviving 30 more years of experimentation. I am a painter who strives for the illusive. A mountain of “talent”, work, ego, need and “what I like” is usually another mediocre work of art. Luck and being at the right place at the right time, therein lies my better pieces. I strive for visual poetry. Common place scenes that hopefully open up a world of meaning in the viewer’s mind. Michael Breidenbach (b. 1972) aka Moe Profane is a 5th generation native of the Ohio River town of Evansville, Indiana. After earning his MFA from Miami University at Ohio in 1998, Profane spent time developing his artistic practice in Louisville, Kentucky where he describes he was “refining the Relativist Pop Art perspective shaped by his experiences as a recovering Catholic, cancer survivor and at times optimistic existentialist.” In 2010, Profane and his two children relocated to San Antonio, Texas where he currently lives and works out of his home studio he lovingly refers to as Casa Fresca. Additionally, Profane recently acquired a second studio space in Houston, Texas. 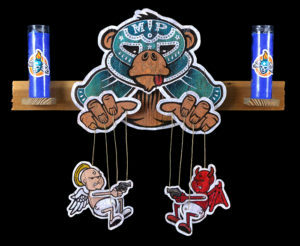 In General Malaise and Morality Plays, Profane incorporates the Id and Ego cherubs with a nod to the tradition of home altars and wall shrines. Profane combines imagery referencing the unique blend of German and Mexican history and culture that heavily influence the city of San Antonio. My work is a combination of quick, simple, iconic imagery with a layering technique that creates captivating universes of complex physical depth. My work possess a perceptible history that gives them a more authoritative tone and sense of importance. The typographic elements and unexpected juxtapositions reveal a depth of concept with a degree of humor, showing how arbitrary our cultural narratives can be and how difficult it is to justify the conventional after it has been more objectively reexamined.